Who else loves watching the Olympics? I admire the skill and discipline of the athletes and I love the beauty of the winter setting. The 2010 Winter Olympics begin tomorrow night and we'll be tuning in for alot of the games. One of the first events is ski jumping and I'm for sure going to watch that. Because they are crazy. 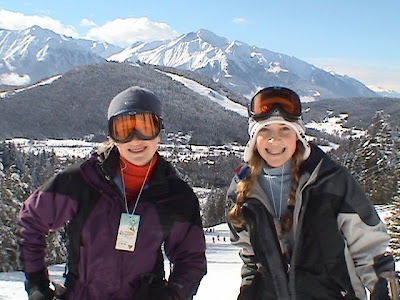 In 2005 we took a family ski holiday to a little town in Austria called Seefeld. It is a storybook village plunked down in the Alps and we all say this was one of our very favorite trips. We flew to Munich and drove a couple of hours over to Seefeld...a small avalanche had closed the main road so we had to come in on a more circuitous route and it was absolutely beautiful. We stayed in a quaint little hotel and woke up every morning to this view from our window. Everyone was so friendly, the food was wonderful, and the weather was perfect. It snowed about a foot half way through our trip which made for great skiing. About mid week we took a day off from the slopes and drove about 10 miles up the road to the town of Innsbruck. 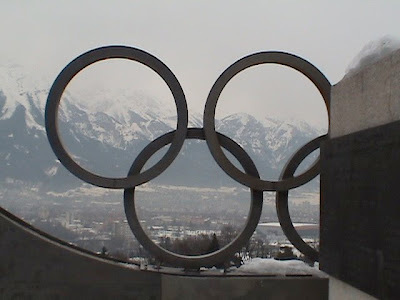 Innsbruck hosted the Winter Olympics a couple of times, once in 1964 and again in 1976. I remember the 1976 games...that was the year Dorothy Hamill won a gold medal in figure skating and drummed up business for hair salons all across America. Everyone wanted her haircut in 1976. She was the Jennifer Anniston of the Winter Games. 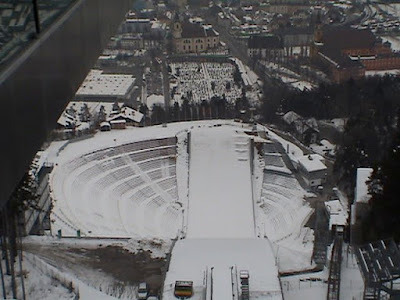 While in Innsbruck we went out to the ski jump venue known as Bergisel. 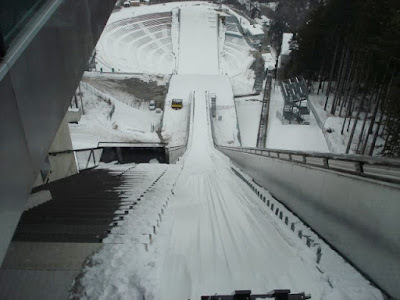 You come in to the stadium and ride a cable car up to the bottom of the ski jump. Even writing that doesn't sound right. There is a cafe here and we had some lunch and then rode the lift up to the visitors platform. The tower at Bergisel is about 165 feet high and they take off going about 60 mph. There is a small balcony on the visitors platform and you can stand just above the speeding lane of the jump. It looked scary enough from the ground. The word steep does not do it justice. As we stood there I had to wonder about the first person to try this. I was sure it was a man. Sorry, I know that is terribly sexist but I can imagine some guys sitting around saying, 'hey, I have an idea..." In fact it was a man, a Norwegian lieutenant named Olaf Rye back in 1809. He flew just over 30 feet in front of an audience (of course). I guess this started that one upmanship thing because in 1862 another Norwegian jumped almost 100 feet over a rock without the benefit of poles. It would never occur to me to jump 100 feet over a rock, with or without poles. And it was 1862 so I'm pretty certain the gear was not anything even remotely close to what they have today. Today they can go over 600 feet. Not always successfully though. Remember the video footage from the Wide World of Sports that was played back in the 1970's as they ran the opening credits....'the thrill of victory and the agony of defeat'...yeah...the agony of defeat was a ski jumper who miscalculated and went tumbling out of control while we watched. There is a building at Bergisel you can walk through to read some of the history of the sport. They also have a continuously running video clip of ski jump disasters. It is almost too hard to watch. You have to look away. Did you know there is an Olympic sport called skeleton racing? The racers go head first down a bobsled track while their chin and toes are just millimeters from the ice all while balancing on a steel and fiberglass sled going approximately 80 miles an hour. They must have the same DNA as the ski jumpers. Ski jumping begins on Day 1 in Vancouver...the qualifying round is at 10 am Friday morning and the individual final rounds on Saturday morning. I'll be watching. I admire their guts and their coordination and their skill. And their mamas, who I'm sure hold their breath until the skis are planted firmly back on solid ground. I am still focused on the cemetery outside the stadium. Yikes....looks so dangerous from the top. Balls of steel those athletes have! 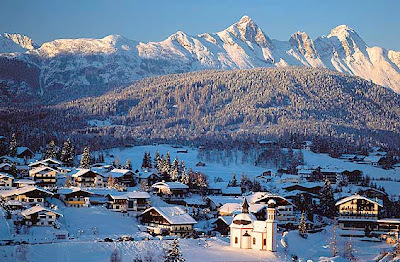 We are heading to Austria next weekend to ski. Your pictures are amazing. One thing I love about your blog is that you make settings and stories come alive. 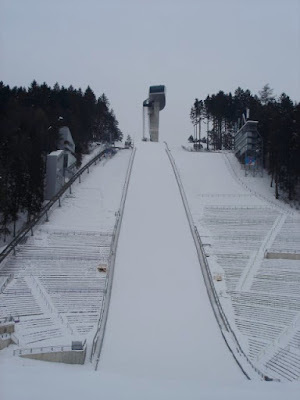 Thanks much for the pictures of an area I've always wanted to visit, and some great facts on ski jumping. If that were my kids, I'd have to look away too! What a fun trip! I love watching the Olympics and look forward to the coming week. These pictures are amazing, Joyce! What a wonderful adventure! I hope to catch some of it on TV. Beautiful pictures! And no, I could never do that! So scary! Sounds like so much uh...fun?? No thank you!! I love watching though. I also enjoy the skeleton, but not sure why. Beautiful pictures and great post. Sounds like a wonderful trip. Your pictures were beautiful. But oh it got my stomach just looking at that drop from the top. Geesh... I usually do not watch a lot of TV or the Olympics. But I do enjoy the Winter Olympics. Enjoyed your post! 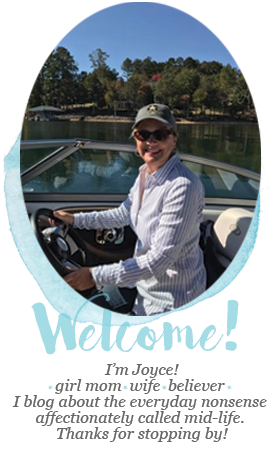 It is so wonderful to be able to share experiences and travels like these through your blog, Joyce. You are so generous to do so with all of us and I appreciate it so much. Oh, I do remember the skier that toppled from the ski jump while Jim McKay, the commentator said, "..the agony of defeat....". And regarding the Skeleton racing? How does a person know that they want to do this particular sport? And why would they want to do it? Go figure. To each his own, I guess, but I can scarcely stand to watch it. Oh my! :-) I'm serious! What beautiful pictures of your trip! I can't even imagine going down that ski jump. I would never make it. I also love to watch the Olympics. Love & blessings from NC! 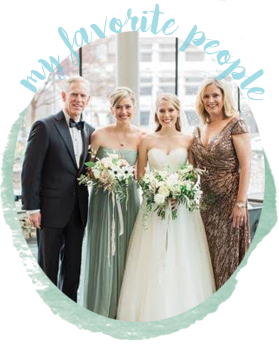 It's so great that your family has had so many wonderful experiences. I love the first picture of the little town. It really does look like something from a story book. I cannot imagine going down that steep jump. It made my stomach jitter just looking at the picture. We'll be watching tomorrow night too. Thanks again for the birthday gift. I had the most wonderful day today and you were a huge part of the reason why. You're just too sweet! Those pictures of Austria are breathtaking and beautiful! Definitely putting that on the places I want to see before I die list. Wow. And I'm always fascinated by the olympic athletes. If only I was inspired to do more than just sit on my bum watching them work their bums off I would be doing a lot better. Don't you just love the strategic placement of those cemetaries? When we visited Zermatt, Switzerland, we found a cemetary right outside our hotel where they've buried mountain climbers who died trying to climb the Matterhorn. I got the willies looking at the bird's-eye view picture. How awesome is this???? Amazing pictures! I cannot wait to read more! Now that is pretty steep isn't it? Hmmm, I might have to rethink the ski jump answer. LOL. And how ironic that there is a cemetary in full view. Sheesh. Were they trying to make a statement or what? LOL. 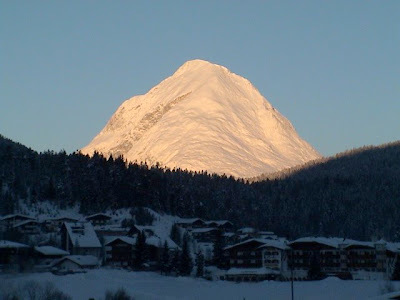 The picture of the snow covered mountain in the sun is stunning! I've always thought ski jumping was the original Extreme Sport. Can't imagine how *anyone* gets the nerve to do it for the first time. It's not like you can practice w/a safety net or bungee cords until you get it right!